After teaching reading for many years and trying to teach children good skills to analyse and understand the text, I was delighted to find the specific strategies of Reciprocal Teaching. Obviously, most of us use many of these strategies but I really like the explicit nature of the named prompts. 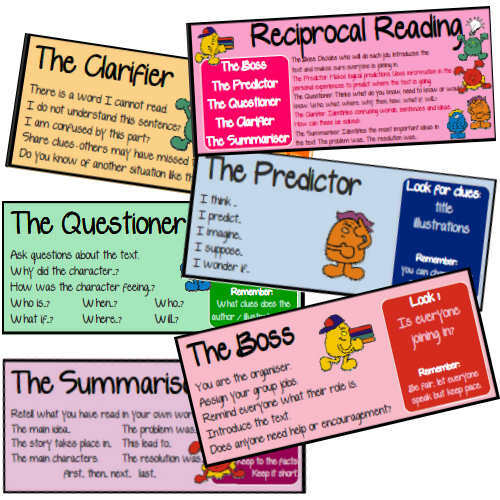 I've developed these prompts cards and have added a variety of cues to each reading prompt card so after a few lessons the children become more competent and familiary with each role, the children can actually work independently on a piece of text. Each card can be laminated and used as a book mark or to section the page if one paragraph is being used at a time. The Boss. Decides who will do each job, introduces the text and makes sure everyone is joining in. The Predictor. Makes logical predictions. Uses information in the text & personal experiences to predict where the text is going. The Questioner. Thinks what do you know, need to know or would like to know. Who, what, where, why, then, how, what if, will...? The Clarifier. Identifies confusing words, sentences and ideas. How can these be solved? The cards are suitable for display too! Aloe sunscreen spray, Aloe sunscreen 30 SPF & 5* UVB protection, water-resistant sunscreen containing soothing aloe vera!